and young adults with relapsed acute lymphoblastic leukemia. of the treatment in different types of patients. 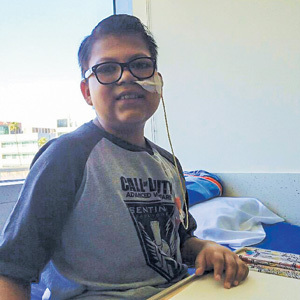 returned for the third time, his doctor immediately referred him to CHLA. have their son in the study. connects with the CD19 protein, the leukemia cell is destroyed. leukemia cells as possible. Then his modified T cells were re-infused. extreme, causing the patient’s blood pressure to plummet. response could be safely managed. “It was scary,” says Daysi. therapy to offer their most seriously ill patients. CHLA, he was ready to return home. He always bounces back, Daysi says. “He wants life,” adds Jorge. Alexis has been in remission from leukemia for nearly 20 months.